Years from now people will be looking at these pictures and wondering what was going on in 2016. One thing that happened is that a couple of whack-a-doo brothers decided to "seize a federal building" and get involved in a long standoff. Well, these mental giants decided that a bird-watching outpost in Buttlick, Egypt was the best place to seize. A few months later they left hungry and defeated. It was the single dumbest story of 2016. 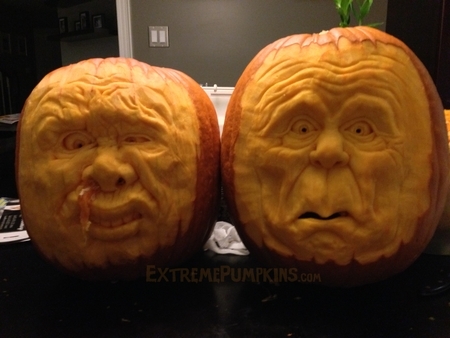 This person carved two pumpkins and sent them in.